Some people point their antenna towards the most fringe station they wish to receive and usually the closer ones are picked up regardless. If you have two main directions that you wish to receive, you can sometimes point your antenna between the two. 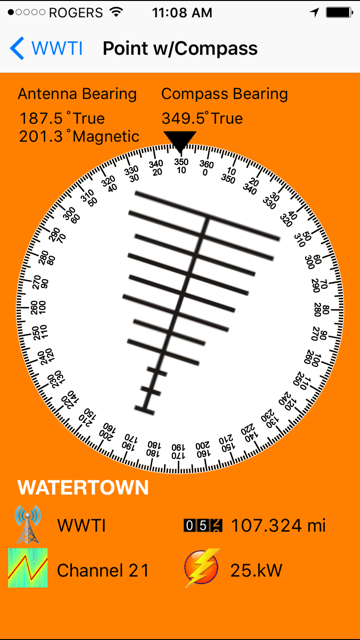 If fringe stations are not important, an antenna like a DB8e can be aimed in two directions. Use multiple antennas on a coax a/b switch. Here are a couple of ways to help point your antenna. OTAMap is a IOS app which helps you to point your antenna to your desired television station (amy other things). First select your desired station, You then can point using either the compass or an satellite map view. If you have clear landmarks the satellite view may be best. 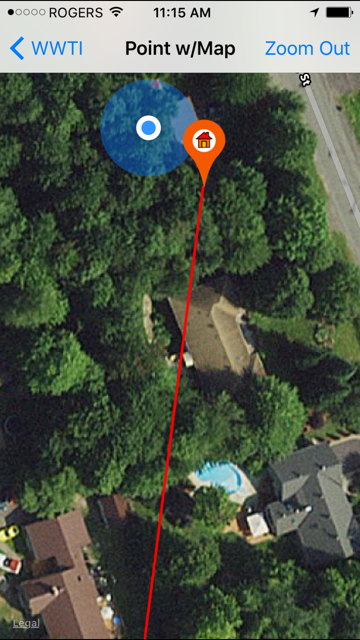 In the example below I simple aim the antenna towards the middle of my neighbours house! The app can store locations and I have stored the GPS location of my tower base. 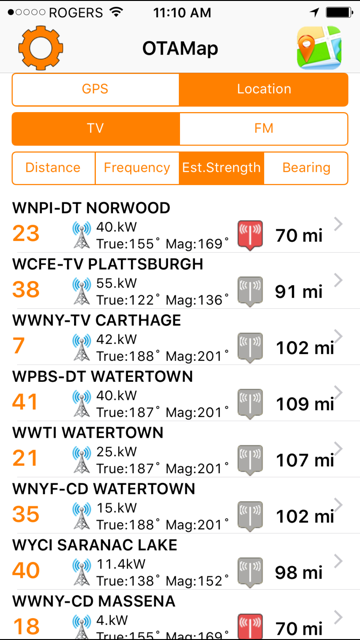 You can use the results of my contour web page to get bearings to your desire station. Then use a compass to aim your antenna. This method is only accurate to a postal code level, so in a rural area, the bearing may be off. You can go to www.tvfool.com and enter your postal code. 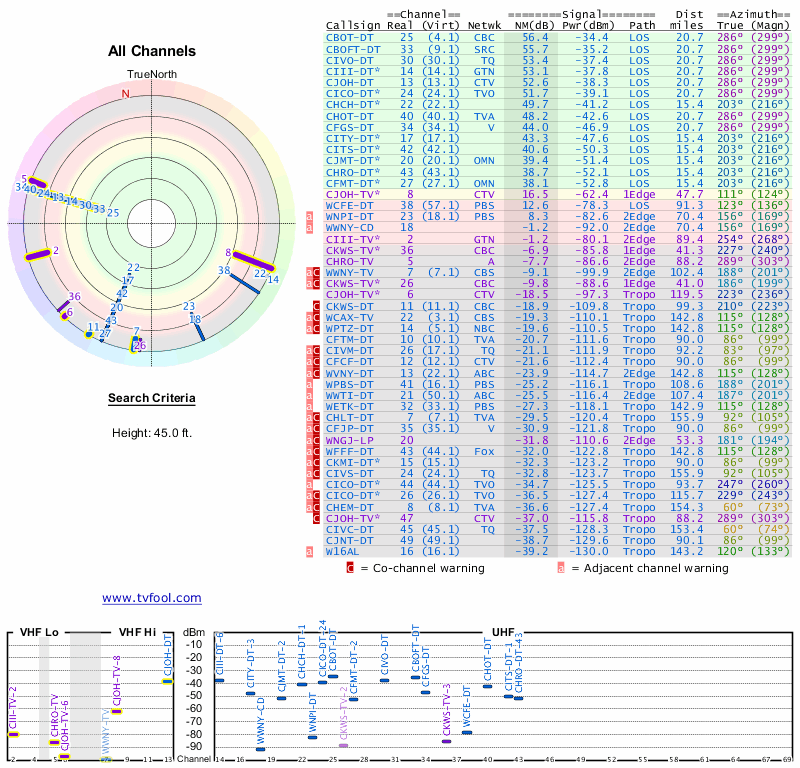 TVFOOL produces a radar-like chart showing all the closest stations and their directions. TVFool can also produce a satellite view to the closest stations (unlike OTAMap, not any specific station).